I didn’t so much as go to China. China came to me. They said can you? and I said yes. This is the result. 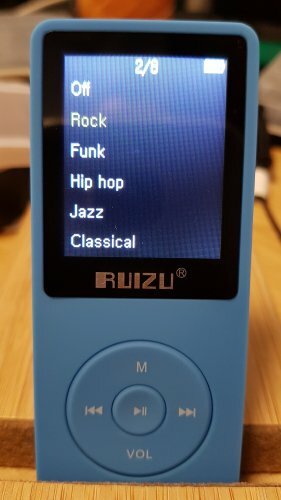 I was approached by Ruizu following my last review of the AKG K1000. I agreed to write an honest appraisal of a product of my choice. So here goes…. They’re a Chinese company. They have been going since 2010. They can make everything from recording pens to jump starters. They can chuck out 6000 items a day. The products available on Amazon are very cheap indeed. This costs a measly £22.99. Prime members will get this delivered free the next day they’ve ordered it. Thus the price of a double CD if anyone buys such things anymore. Or a single LP. So It’s cheap. That’s that bit done. You don’t like it, you can send it back. 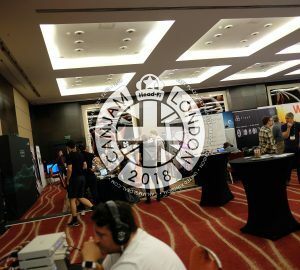 You do like it; you’ve got an audio bargain by headfi standards. A bargain by any standards in fact. So let’s see whether this thing is any good, What it does and doesn’t do and what it sounds like more importantly. The X02 will handle mp3 flac and wav files but will not handle hi res files beyond 16 bits. It takes a micro sd card. My 256 Gb was recognised immediately. The player also has 8 Gb flash memory. The gui is extremely simple. It looks very outdated. It’s simplicity means you get up to 80 hours of playback on a charge. 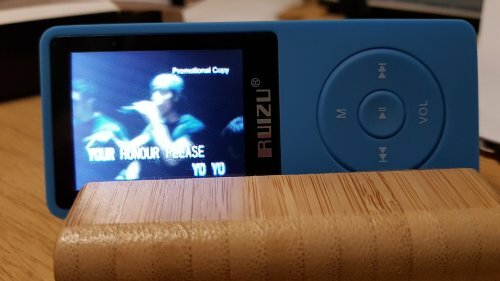 It displays album artwork, lyrics and even videos if formatted to a suitably low level. 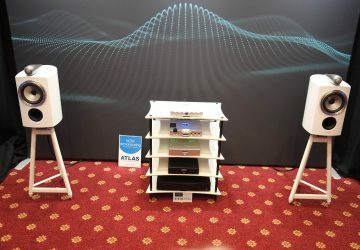 You have ebook reading functionality here; even fm radio via the cable of your earphones which are used as the antennae. 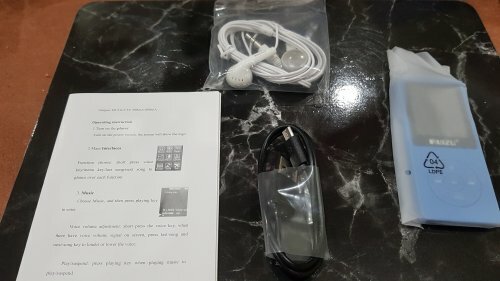 A pair of earbuds are enclosed, a usb cable, a manual and of course the player itself. The question is; all well and good on the features list but does it all work in practice and does it work well? The player looks cheap. It’s made of plastic. 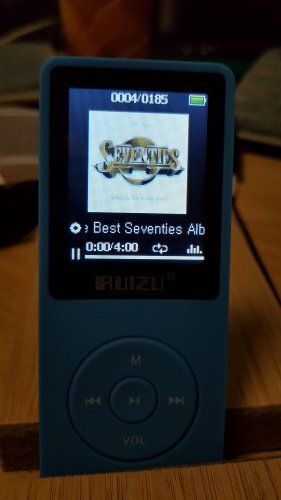 It looks like the old iPods from days long gone by. Looks aren’t everything thankfully but this dap would greatly benefit from a newer look. Cosmetics aside, this plastic shell makes for a strong player. I’ve got a feeling that it will look exactly the same in 10 years time as it does now. It has curved edges, a screen protector factory fitted and the X02 is non touchscreen. A discrete switch at the bottom of the unit will boot this player up in 3 seconds flat. The sd card was similarly recognised. Everything is accessed through the rocker control at the bottom. You can have the presses as silent or a beep. What is about to be selected is highlighted. 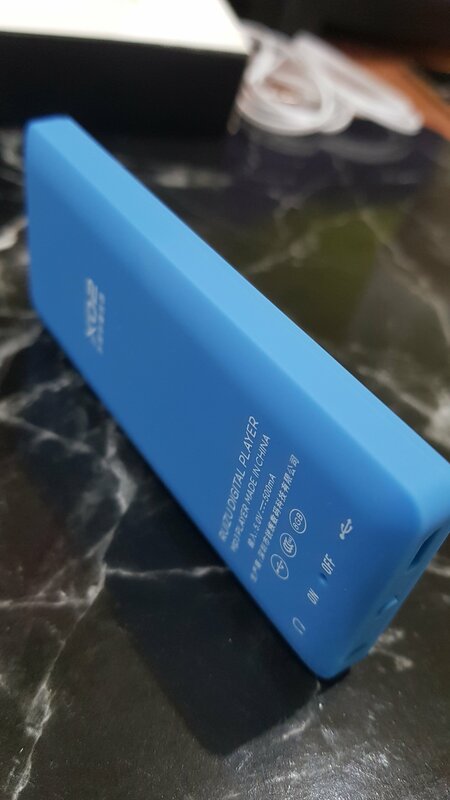 A long press of the volume button will allow a volume change. Left and right adjusts either loudness or sub menus back and forward. All very easy to get to grips with. There are eq settings to tailor the sound. Believe me for this player you will be using them. The rock setting is where my ears are at their most comfortable. A quick flick through the contents supplied- a manual, written extremely well for a Chinese document, this spells out exactly how easy it is to use the various bits and bobs. There is a calendar and alarm, stopwatch and record function I havent yet mentioned. 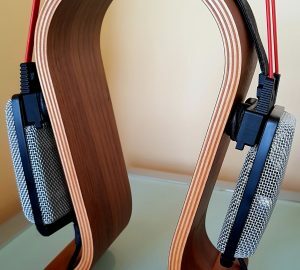 They may or may not be an important part of your daily routines as an audiophile or music lover; but I’ve told you so you’re now suitably enlightened. 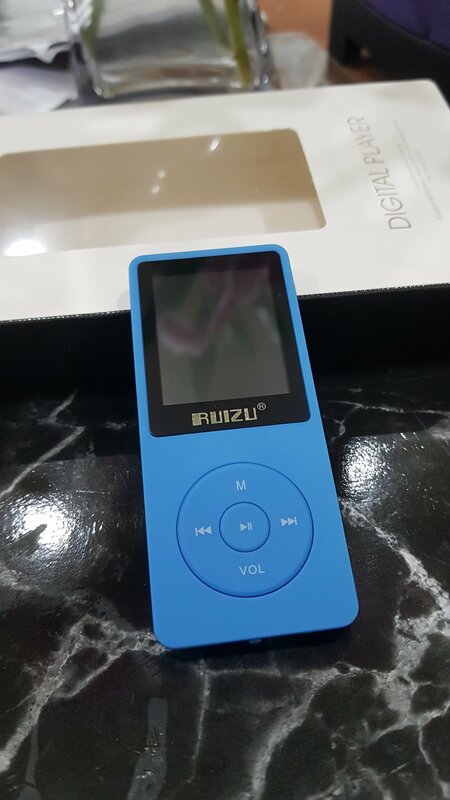 I had a preconceived idea that this mp3 player was going to sound absolutely awful. 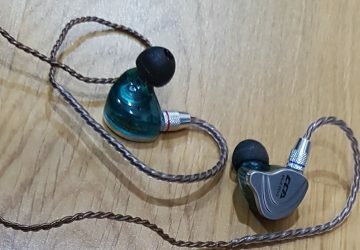 I put on a pair of self customised obravo Erib 2 hybrid planar dynamic iems and my worst fears were realised. 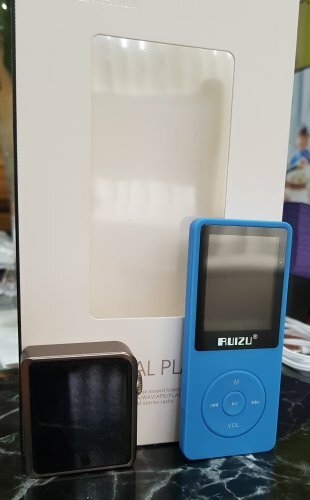 The sound was shrill and thin, compared to my smartphone or my latest acquisition, the Shanling M0…well,there was no comparison. I packed the whole lot up after enduring 10 minutes vowing to not get involved in these cheap Chinese creations again. But then I got to thinking…. The next day came and I had come up with a cunning plan! I had pondered the problem; I hadn’t ruled out that the X02 sounded awful. Sure, it sounded awful through the obravo’s. But was it the earphones that sounded awful, or the player? Could there be a mismatch here? I considered the problem; shrill and thin sounding was what I’d heard. Could there be a mismatch at play here? The obravo’s have a detailed treble and mid section,although on most other devices they were bassy too. Earbuds they are not. I rummaged around and tried on the Simgot iems, again customised. These are dynamics which are more rolled off and have a more visceral bass impact than the Erib 2. In contrast, the Erib 2 has a more linear bass presentation. I put on the Simgots and braced myself for another pounding and…to my surprise, the sound was actually presentable! and in a quiet listening environment, where my concentration should be able to discern chalk from cheese, I was impressed. There was an emphasis on vocals and synth effects. The X02 was bass light but not excruciatingly so anymore. The soundstage of the Ruizu is actually slightly better than that of my Galaxy S7 and us less muddy sounding. 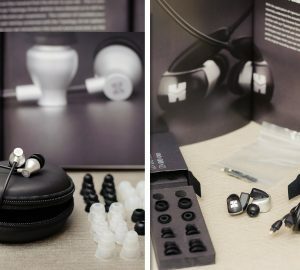 With the caveat that one must be careful regarding matching up a suitable earphone or earbud. 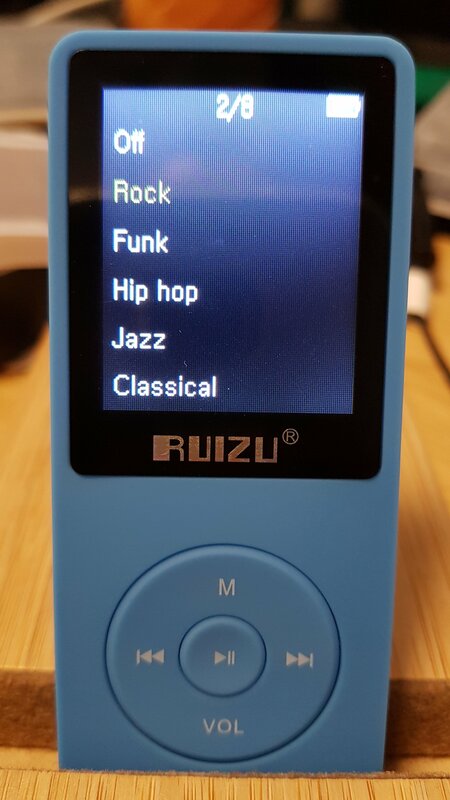 When out for a run with the Ruizu, further modification is needed. The pounding of feet will inevitably remove what little bass there is. Raising the volume simply highlights this. Utilising the bass function on the sound settings within the player takes a great deal of edge off the mids and highs and adds some much needed lower end depth. It makes the X02 perfectly listenable on the move. 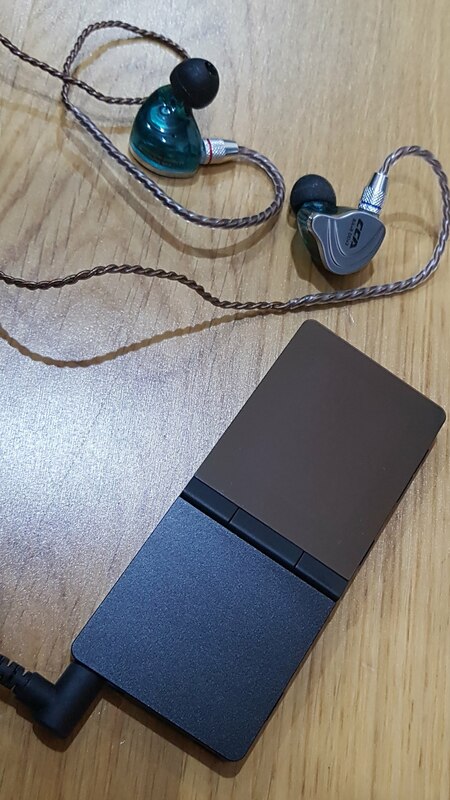 The Shanling M0 is a stunning dap for the money. 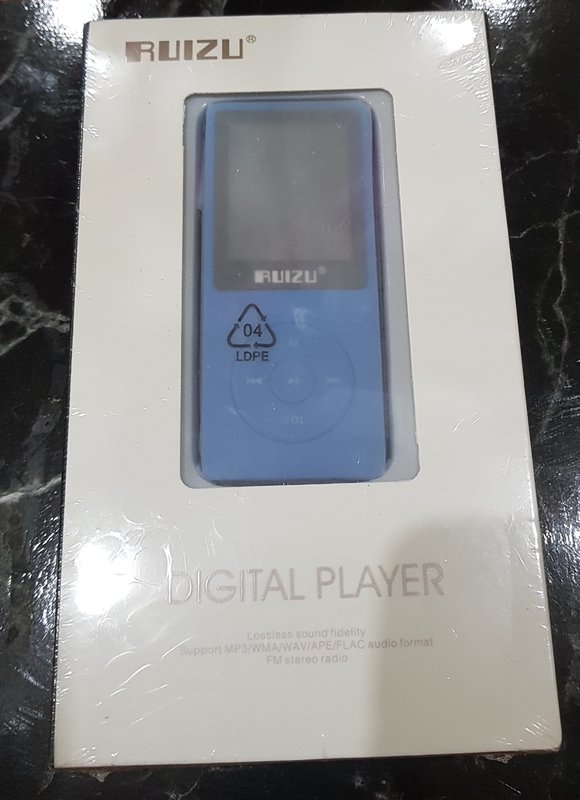 I bought it for around £70. That is 3x the price of the X02. The M0 sounds richer through all iems and looks and feels more gorgeous. 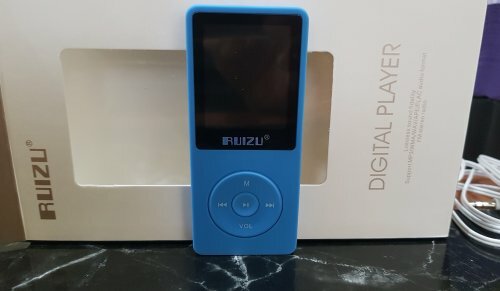 It has far more features than the Ruizu. The X02 wins on simplicity,speed of operation and in being bomb proof. I was wrong to jump to conclusions about the Ruizu X02. With the right set of iem’s or buds, (I’m anxious to get a get a set of VE Monks or Zen’s on this), the X02 represents incredible value for money. You will get some texture and some soundstage and you should be able to follow the vocalist wherever they are bound. A little experimentation is called for when you’re dealing with the Ruizu X02. I am fortunate enough to have many many different options available to me. 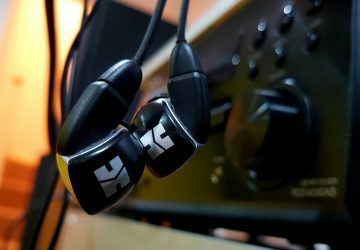 The bass function will tone down an iem that is too lively, but it’s best to start with a set that will bring out the attributes in this dap. The correct match for an in ear is a bassy rolled off sound signature; put a lean forward sounding monitor in your ear and be prepared to grit your teeth….. I would be extremely interested in what this company could produce for £70 given what they’ve achieved for £23. I’m also glad that I found plenty of positives to talk about when i started so far on my back foot that I thought I was gonna fall over!